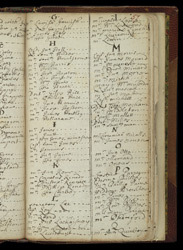 This is the journal of a voyage to Antigua. It was written by a trader who left England on the 30th January 1679 with the Turkey Merchants of London. Included in the journal are accounts for weights of sugar and tobacco sold by the plantation owners on the island. There is also a list of all the men with whom the merchants traded goods.